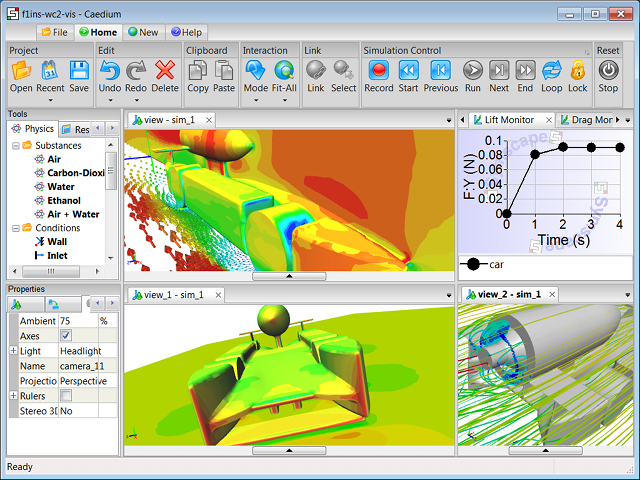 OpenFOAM is developed by OpenCFD Ltd., which is led by Henry Weller. The software and any derivatives (such as the work described here) are freely available under the GNU General Public License. OpenFOAM is dependent on a Unix build environment using tools such as bash scripts, make and flex. Some source filenames within OpenFOAM are identical except for upper and lower case differences (e.g., "vector.H", "Vector.H"). Windows does not, by default, differentiate between such names. Also, these names can clash with standard system filenames such as "vector.h". OpenFOAM makes system calls to Unix specific functions such as getenv. OpenFOAM has a cyclic dependency between its Pstream and OpenFOAM libraries. One option to build and run OpenFOAM on Windows is to use Cygwin, which emulates a Linux environment for building and running Linux programs. To overcome filename clashes all names likely to clash must be changed. While Cygwin is an option (as demonstrated by "The Unofficial OpenFOAM Cygwin Port" and "OpenFOAM extensions") for those that don't have access to a Linux computer, it comes with the overhead of slower runtime speed and is complex to configure. A cross compiler allows compilation of source code on one computer-OS pair (such as Intel-Linux) that is destined to execute on another computer-OS pair (such as Intel-Windows). A Windows cross compiler (combining gcc and MinGW) running on Linux can use the OpenFOAM build environment with only minor modifications and requires no special treatment for the filename clashing issues. By initially focusing on a serial (rather than parallel) version of OpenFOAM, the cyclic library dependency can be avoided by compiling the dummy Pstream files as part of the OpenFOAM library. The remaining task is to provide the native Windows system calls to mimic the current native Unix system calls that OpenFOAM uses. Within the structure of the src/OpenFOAM library is the OSspecific directory that contains a Unix directory and is also where a new directory, MSwindows, will house the native Windows source code. Once compiled the executables and libraries produced by a Windows cross compiler will not require any Linux emulation (such as Cygwin) and will run as fast as any other native Windows application. A drawback of this cross compiler approach is the inability to build a new executable using the OpenFOAM libraries under Windows unless you are willing to enable the case sensitive file system option. Another option would be to combine the modifications described here with those in "The Unofficial OpenFOAM Cygwin Port" for a Windows build environment. "mingw32/include/float.h" to include the right "float.h". Install the OpenFOAM 1.4.1 source distribution on Linux. Remove all lnInclude directories using wcleanLnIncludeAll in the OpenFOAM installation directory. Thanks to Jason Dale for pointing out this problem. Remove the directory src/OpenFOAM/OSspecific - it has to be out of the OpenFOAM source tree completely. It will be recreated by the patch. Patch (using the Linux patch command) the OpenFOAM 1.4.1 source distribution with our MinGW Windows modifications [last updated April 3, 2008 to v5]. Copy wmkdep and dirToString from wmake/rules/linuxGcc to wmake/rules/linuxmingw32. Modify and source the .OpenFOAM-1.4.1/bashrc-mingw32 script to match your OpenFOAM 1.4.1 source location. Build using Allwmake in the OpenFOAM-1.4.1 directory on Linux. Transfer the OpenFOAM executables (applications/bin/linuxmingw32DPOpt/*.exe) and libraries (lib/linuxmingw32DPOpt/*.dll) to the Windows computer. Launch a Windows command prompt to run OpenFOAM. The WM_PROJECT_DIR and WM_PROJECT_USER_DIR variables are set. The .OpenFOAM-1.4.1 directory from the original source distribution is within the WM_PROJECT_DIR. 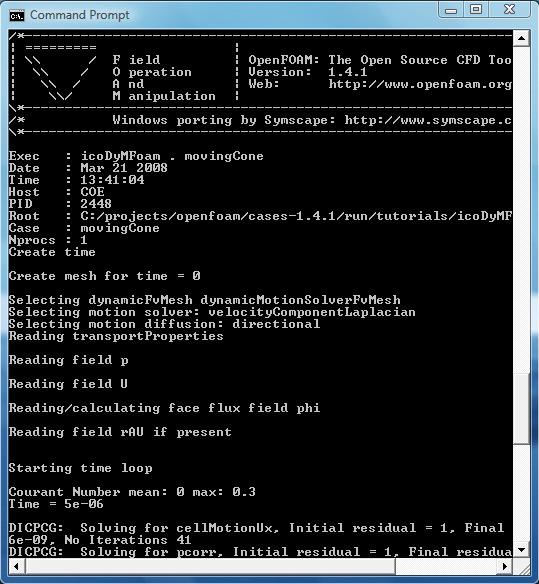 The PATH variable is set to include the OpenFOAM executable and library locations. You may need to copy foamFlex++ from a Linux OpenFOAM build to the MinGW build (applications/bin/linuxmingw32DPOpt). Submitted by symscape on March 25, 2008 - 13:02. The process described here is a workaround for the cyclic dependency between the Pstream and OpenFOAM libraries. You only have to perform this process once, after which libOpenFOAM.dll will depend on libPstream.dll. You can then compile other libPstream.dll libraries, such as mpi. Ensure the parallel library you wish to use is in your executable path on Windows. Submitted by symscape on March 26, 2008 - 10:37. Here are results of an execution time (as reported by OpenFOAM) comparison between OpenFOAM running on the same dual boot computer. The case was the icoDyMFoam (movingCone) OpenFOAM tutorial. Wine is a Windows emulator that runs under Linux. Submitted by symscape on March 27, 2008 - 14:58. Another timing comparison (suggested by Henry Weller) for a much larger 3D case using the same machine as previous. Submitted by symscape on March 28, 2008 - 14:10. Thanks to Bernhard Gschaider for pointing out some deficiencies in the OpenFOAM Windows patch and Henry Weller for suggesting a solution. The latest patch (v3), in the build process above, now allows multiple platforms (e.g., MinGW and Linux) to build using the same source without having to start from scratch each time. Submitted by symscape on March 29, 2008 - 10:27. Thanks again to Henry Weller for suggesting a better encapsulation of the OSspecific library. The latest patch (v4), in the build process above, builds the OSspecific object collection which is then linked into the OpenFOAM shared library. This is a more flexible approach to allow the OSspecific library to vary across platforms. The final compiled runtime libraries and executables from patches v3 and v4 will be identical, so if you've already compiled OpenFOAM using v3 then there's no need to compile again with v4. Submitted by symscape on April 3, 2008 - 10:40. Thanks to Allen Zhao for pointing out that applying the previous patch (v4) didn't create needed empty Make/options files. The latest patch (v5), in the build process above, now ensures, that when applied, the patch will create empty Make/options files. Also redundant linking to libOpenFOAM is removed when building executables. Submitted by Allen Zhao (not verified) on September 3, 2008 - 15:21. This is Allen. I am running into a "floating divide by zero" issue on Windows. Following is what I posted on OpenFOAM message board. I am wondering if you know of a MingW compiler option that could be more tolerant to such error? On Windows (MingW port) his error will get triggered with or without FOAM_SIGFPE being set. The same source code compiled with Linux/gcc can run when FOAM_SIGFPE is NOT set, but will crash in the same location when FOAM_SIGFPE is set in the env. So obviously, this is an issue with the Foam::sigFpe::set() implementation. Is there any special gcc switch used in the Linux compilation that allows more tolerance to division by zero? Submitted by symscape on September 4, 2008 - 07:34. Thanks for posting this problem. I think it is an issue with the MinGW compiler. I propose that we try an OpenFOAM source code modification rather than try to mod the MinGW compiler.
) << "Cannot reset SIGFPE trapping"
<< "FOAM_SETNAN not supported under MSwindows "
)   << "Cannot call sigFpe::set() more than once"
// signal handler to decide what to do.
) << "Cannot set SIGFPE trapping"
Submitted by symscape on September 5, 2008 - 09:22. So I dug a little deeper and found that the original (and modified) implementation of src/OSspecific/MSwindows/signals/sigFpe.C works as you'd expect under Wine on Linux and Windows XP. I set the dos variable (set FOAM_SIGFPE=1) and the application stopped (without an error message - but that's another story). When I unset the dos variable (set FOAM_SIGFPE= ) the application worked fine reporting "FPE result = infinite"
I wonder if there's something affecting the FPE behavior within your environment? Submitted by Paritosh (not verified) on March 21, 2014 - 05:00. These instructions seem to be ok for someone who is expert with linux. Can some one please post same intructions explained step-by-step along with exact commands? It would be very helpful for people like mewho can barely run linux.